Countdown goes on for the 2013 edition of the Italian Baja, which will take place next week from 14th to 17th March. Entries have been closed on Wednesday, confirming that over 100 competitors will take part in the race, including three trucks belonging to the Orobica Raid of Giulio Verzeletti, assuring an extraordinary complete show. “Our vehicles are not in very good shape, after taking part in the Dakar – remarks the Team manager from Bergamo – but we did our best to carefully prepare them to face the Baja, considering hardness and fastness of this beautiful race”. Two of the Unimog Mercedes Benz 400 will be driven respectively by Paolo Calabria, navigated by Giulio, and Giuseppe Fortuna, together with Eleonora Dal Prà. 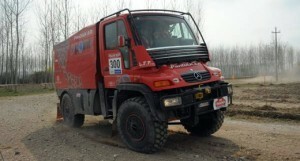 The third truck will be driven by the Team manager’s son Giacomo, with a nowadays still nameless navigator. As Verzeletti explains “There must be three persons on board to face the Dakar, as a mechanic is necessary in any time and each other’s psychologically support is important, as it deals on a weary difficult track. On the contrary, at the Baja driver and navigator can perfectly manage the race, paying attention to track’s traps”. Trucks dispose of a four wheels traction, a 6400cc engine and about 400HP. Comparing last year’s trucks weight, instead of 82ql they now weigh just 65ql. “It has been 15% lightened and that means a proportional 20% power increasing”. The Orobica Team seized three good positions at the Dakar, as Verzeletti gained the 5th place, immediately followed by Alex Caffi at the 6th position and Marino Mutti, who came in 7th. They probably won’t have to face any challenger at the Italian Baja, but to fight an inner duel, although nobody knows, maybe some late entry could suddenly surprise them. The Team will line up also the biker Jacopo Ceruti, probably riding a Suzuki.